Cartlock 5, plastic padlock security seals - buy now. Cartlock is a plastic, 'padlock' type, single use, tamper evident security seal with an acetal insert for enhanced security. It is designed for quick and easy application with tool free release. With a 3mm diameter hasp it is suitable for sealing airline carts, ballot boxes, lockers, luggage etc. Supplied in boxes of one thousand seals, pre printed with sequential numbers, normally available for despatch within 2-3 days. 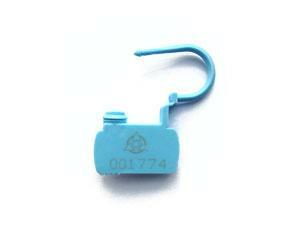 Polypropylene 'padlock' tamper evident security seals, with easy application. Pre printed with sequential numbers. 1 box=1,000 seals @ £99.00 per box excl VAT. Do you need a smaller quantity or a customised version ?